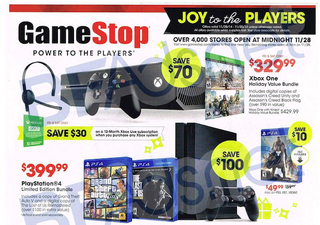 Let's take a minute to be grateful for Thanksgiving's annual traditions: turkey, football, and GameStop's Black Friday deals leaking before they're supposed to go live. This year's deals include a $400 PS4 bundle with GTA V and The Last of Us, games like The Evil Within and Madden 15 for $30 each, and a $330 Xbox One Assassin's Creed bundle that comes with digital versions of Unity and Black Flag. Other decent deals: Shadow of Mordor (PS4) for $30, Tales of Xillia 2 (PS3) for $20, and some heavily discounted headphones, among many others.